Message From the President – Ride Waivers, Why? Our Ride Leaders require those participating in their rides to complete a Ride Waiver prior to any ride and the Club requires the same before all of our four major events (Icicle, Doublecross, Shorefire and Savage). reminding the cyclist that they can discontinue riding at any time if he or she believes conditions to be unsafe. By signing the Ride Waiver, a cyclist understands the inherent dangers of participating in a Club-led ride, accepts those dangers, agrees to ride at their own risk, and agrees abide by the directions of the Club via the Ride Leader. But, why is all of this important? It’s important because the Ride Waiver protects the Club from litigation. It is something that was formulated under the advice of legal counsel when the Club decided to offer major events and later when the Club began to offer organized rides led by members of the Club. It is also something that is required by our insurance carrier to limit the Club’s exposure to litigation. As most of you may know, White Clay Bicycle Club in a not-for-profit entity. What money we collect during a year by means of membership and major events is then distributed to other not-for-profit entities to help to defray operating costs that they may incur during a year. As a not-for-profit entity, the Club reserves only enough money to cover its operating expenses for the current year and a year or so into the future. 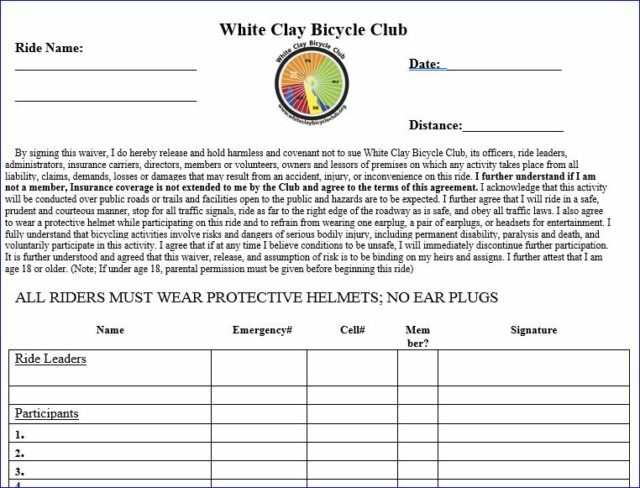 The Club does not hold money to protect itself from lawsuits, so having insurance and having the cyclists read and sign the Ride Waiver is a way of protecting the Club and its future. For this reason, it is very important for all who are participating in any Club-led activity – be it a weeknight ride or a major event – to review and sign a Ride Waiver. It may seem like a nuisance task, but it is a necessary part of being a ride participant. Please arrive early enough to sign the Ride Waiver before each and every ride – it is one more step YOU can take to protect our Club’s future. ← Message From the President – New Member…Now What?